We’ve all been there, your phone starts acting funny and you take it back to the store to have it looked at and they say, “Can’t help you the liquid indicator is red.” Argh! It can be frustrating, especially if you haven’t had a true liquid damage such as having a spill or water submersion. Most iPhone users know that Apple doesn’t cover liquid damage under warranty. A class-action lawsuit claimed the liquid indicator may be overly sensitive thus provides false positives and prevents iPhone users from being able to claim the iPhone through the warranty. Humidity has been implicated in triggering the indicator to change its color. Now Apple has taken a closer look and has begun training Genius Bar employees to look at more than just the indicators color. They must also look for corrosion, water marks in the screen, or other signs that might show indisputable liquid damage. This evidence will definitely result in denial of warranty replacement or repair. 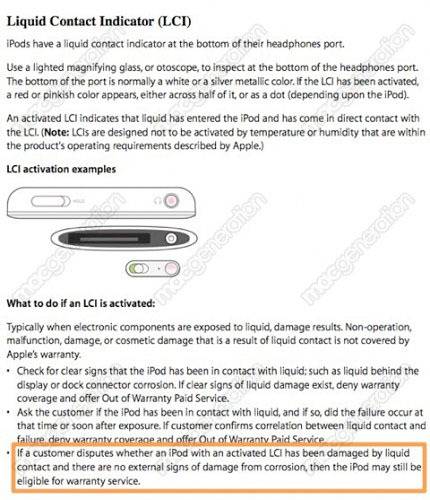 If a customer disputes whether an iPod with an activated LCI has been damaged by liquid contact and there are no external signs of damage from corrosion, then the iPod may still be eligible for warranty service. The wording adds flexibility for an Apple employee to handle situations on a case-by-case basis. If your liquid indicator is red you’ll be starting at a disadvantage to claim the phone under the warranty. For those who are worried about liquids ruining their devices, Worth Ave. Group, covers your iPhone for any type of liquid damage or submersion. If you have both the warranty and insurance, you can be sure that if you have any troubles with your phone related to liquid, you should be covered.